Vero Beach deputies use Facebook to resolve theft case at Applebee's. 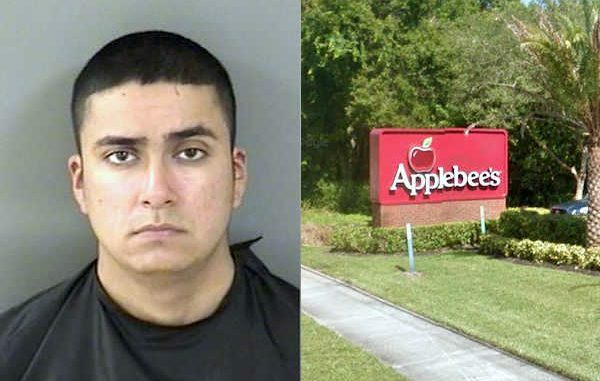 VERO BEACH – A profile on Facebook helped the Indian River County Sheriff’s Office locate a suspect who stole from the Vero Beach Applebee’s. Ricardo Antonio Beltran, 20, was arrested on theft charges after eating at the Vero Beach restaurant without paying for his meal. Deputies made contact with the manager who said two men entered Applebee’s and ordered food, ate, and left without paying their bill. The attending waitress was informed by a customer that one of the men uses a Facebook account with the name “Smokey,” according to the report. The waitress confirmed that the photo on the profile matched the description of one of the men seen at Applebee’s. The total amount of the bill was $48.63. “Upon reviewing the surveillance footage, I observed both subjects enter the restaurant at 1401 hours. The subjects sat at the front table and ordered food. They ate their food and exited at 1439 hours without rendering payment,” the deputy said in the report. The surveillance footage then showed the men leaving in a dark blue Chrysler 300, which was registered to Beltran. Deputies made contact with Beltran near his Vero Beach residence, but he denied all allegations made against him. “I then showed him a photograph of the suspect wearing the same clothing he had on, and he still denied being there,” the report said. Beltran was arrested and transported to the Indian River County Jail.